This topic describes how to install and configure a test controller, and how to configure test agents so that you can run tests in a lab environment using Microsoft Test Manager. You have to install and configure at least one test controller for your team project collection, before you create a lab environment in that team project collection. When you configure a test controller for a lab environment, you have to register it with your team project collection. You also have to configure the security of your test controller based on your topology. Use this topic to set up a test controller when you configure a lab environment in Microsoft Test Manger. If you want use Visual Studio, instead of Microsoft Test Manager, to set up test controllers and test agents to manage tests, see Setting Up Test Controllers and Test Agents to Manage Tests with Visual Studio. For information about lab environments, see Using a Lab Environment for Your Application Lifecycle. If you are creating a network isolated environment, before you store the environment in your team project library, install test agents in the environment by running the "Microsoft Visual Studio Agents" CD or the downloaded ISO image.. However, you should not configure those test agents. For information about setting up a network isolated environment, see Creating and using a network isolated environment. If you’re creating a lab environment that contains any Windows XP machines, you must manually install test agents on the Windows XP machines, and then perform some extra steps. See Configuring Lab Environments that Contain Windows XP or Windows Server 2003 Machines. Use these sections to install and configure a test controller to use with a lab environment. When you set up a test controller to use in a lab environment, there are multiple ways to configure security between your test controller, test agents, and Team Foundation Server. These ways use a combination of local machine accounts, domain accounts, and local and domain user groups. These configurations are more complicated when your lab environment is in a cross-domain or workgroup topology. For example, if your test agents are in a different domain than your test controller, you can configure the test controller service by creating a local user account with the same user name and password on your test controller machine and on each test agent machine. However, you can simplify this process by configuring a lab service account on your test controller and then using it to run your test agents. Local machine and domain accounts often don’t work well with certain network topologies. To address this problem, you can configure the lab service account on your test controller. The lab service account allows test agents to connect to a test controller with a single user account, so you can avoid manually setting up user accounts on multiple machines. If the lab service account is already configured on the test controller, then when you create a lab environment, Microsoft Test Manager automatically retrieves the credentials of the account and uses them to configure the test agents. The lab service account also ensures that your test agents run and communicate with your test controllers using minimal permissions. When you configure the lab service account on your test controller, you can also specify alternate credentials that your test controller can use to connect to your Team Foundation Server or Team Foundation Service. This simplifies the configuration of test controllers in complex network topologies. For example, if you want to register a test controller that is in a workgroup or in a domain that doesn't have a two-way trust with the domain for your Team Foundation Server, one solution is to create a local user account with the same user name and password on both the Team Foundation Server machine and the test controller machine. The better approach is to configure a lab service account on your test controller, and use an alternate domain account to connect to your Team Foundation Server. This approach allows you to use a local machine account as the logon account to run the test controller service without adding machine accounts to your Team Foundation server. Any user with administrator privileges on a test controller machine can configure the lab service account for that test controller and specify alternate credentials for connecting to Team Foundation Server or Team Foundation Service. If you run test agents or test controllers on a Windows 8 machine, some additional scenarios require that you configure the lab service account on your test controller. In particular, if you configure a test controller on a Windows 8 machine, and you log onto the machine using a Microsoft account, you must configure the lab service account on that test controller and specify a set of alternate credentials that can connect to your Team Foundation Server. Otherwise, your test controller will not be able to connect to your Team Foundation Server. Similarly, when you configure a test agent on a Windows 8 machine, you can’t use a Microsoft account to log on to your test controller. Instead, you can use the lab service account. When a test agent connects to a test controller, the test controller checks that the user for the test agent service is a member of one of these groups. If the user doesn’t belong to any of these groups, the connection is rejected. If your test controller is registered with a team project collection from and on-premise Team Foundation Server, you don’t have to add the user account for the test controller to these user groups to administer the test controller. If you are a member of the Project Collection Test Service Accounts or Project Collection Administrators group for your Team Foundation Server, you can administer the test controller. If your test controller is registered with a team project collection from Team Foundation Service, access to the controller is limited to members of the TeamTestControllerUsers and TeamTestControllerAdmins groups. You must add appropriate users and groups to these groups to enable them to access the test controller. Here’s how to install a test controller. You must not install and run a test controller on a computer that is also a domain controller. To install a test controller, you must be a member of the Administrators security group on the computer. Load the "Microsoft Visual Studio Agents" CD or downloaded ISO image, then launch the setup.exe file, which is located in the root folder. The Visual Studio Agents Setup page is displayed. Follow the instructions in the installer. To configure the test controller that you have installed, select Configure test controller now. Then choose Configure to start the Test Controller Configuration tool. The Configure Test Controller dialog box is displayed. You can run this tool to reconfigure your test controller at any time. Choose Microsoft Visual Studio Test Controller Configuration Tool from the All Programs menu. Enter the username and password of the logon account of your test controller service. If you don't specify a different account to connect to your Team Foundation Server, your test controller will use this account to connect to your Team Foundation Server. Null passwords aren’t supported for user accounts. Select Register with Team Project Collection. To find your team project collection, choose Browse, and then choose Add to add the server. Optionally, you can type the name in Register the test controller with the following Team Project Collection. In this case, enter the full path. For example, http://<server name>:8080/tfs/DefaultCollection. (Optional) To configure your test controller for load testing, select Configure for load testing. For more information about load testing, see Web performance and load tests in Visual Studio and Using Test Controllers and Test Agents with Load Tests. Type your SQL Server instance in Create load test results database in the following SQL Server instance. If you don’t have SQL Server installed, you can use SQL Express. For more information about how to download and install SQL Express, visit the following Microsoft Web site. For more information about sizing considerations, see Using Test Controllers and Test Agents with Load Tests. (Optional) If you want your test agents to use a lab service account on your test controller, choose Use a lab service account to communicate with the test controller, and then specify the credentials for the service account under This account will be used by test agents to communicate with the controller. (Optional) If you want your test controller to use a different account to connect to your Team Foundation Server, choose Use different credentials to connect to Team Foundation Server, and then specify the credentials in the pop-up window. To apply your changes, choose Apply Settings. A Configuration summary dialog box is displayed. It shows the status of each step that is required to configure your test controller. To close the Configuration summary dialog box, choose Close. Then choose Close again to close the Test Controller Configuration Tool. The Visual Studio Agents Setup dialog box is displayed. From here, you can install any other components that you require on this computer. The test controller runs as a Windows Service named Visual Studio Test Controller. You can start and stop the service and view its properties in the Services tool in Administrative Tools. You can configure and monitor your test controller and any registered test agents using the Test Controller Manager in the Lab Center for Microsoft Test Manager. When you install a test controller on a computer, the registry entry HKEY_LOCAL_MACHINE\SYSTEM\CurrentControlSet\Control on that computer is set. This value silently changes the Service Control Manager time-out from 30 seconds to 10 minutes to provide more time for the test controller to start to communicate with Team Foundation Server services. For more information, see A service does not start, and events 7000 and 7011 are logged in Windows Server 2003. If you install the test controller on a computer that runs an operating system with user account control (UAC) the registry key HKLM\SOFTWARE\Microsoft\Windows\CurrentVersion\Policies\system\ LocalAccountTokenFilterPolicy is set to a value of 1. This disables remote restrictions of UAC to allow remote authentication if a test agent is configured to use a local account. See Description of User Account Control and Remote Restrictions. To configure and monitor the test controller and any registered agents, use the Test Controller Manager in the Lab Center of Microsoft Test Manager. Test agents should be in the ready state. If a test agent isn’t in the list of test agents, or the test agent is in the disconnected state, you can run the Test Agent Configuration Tool on the computer where the agent is installed and the Test Controller Configuration Tool on the computer where the controller is installed. To run the configuration tools, choose All Programs, Microsoft Visual Studio, Microsoft Visual Studio Test Agent Configuration Tool or Microsoft Visual Studio Test Controller Configuration Tool as required. The user for the test controller is a member of the TeamTestControllerAdmins group or the user for the test controller is a member of the Administrators group. 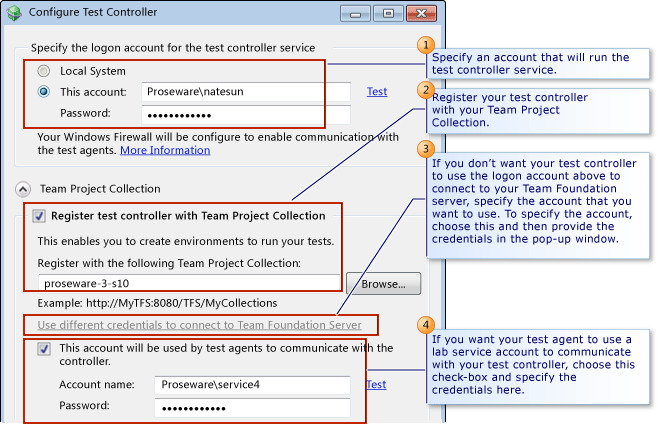 Make sure that the test controller is configured for the correct team project collection. You might want to run with elevated permissions, or restart your computer, if the test controller is running on the same machine as Visual Studio and you have added the user to the TeamTestControllerAdmins group when this user is the active user. The account that you use for the test controller is a member of the Project Collection Test Service Accounts group for the Team Project Collection, or the account that you use to run the test controller configuration tool is a member of the Project Collection Administrator group. The user for the test agent is a member of the TeamTestAgentService group on the computer where the test agent in installed and on the computer where the test controller is installed. If this user is the current user, when you add this user to the test controller machine, you must log off or restart this computer. The correct test controller name and port have been entered. You can also examine the %LOCALAPPDATA%\Temp\TestControllerConfigUI.log and TestAgentConfigUI.log files for errors and more details. You can open these files from the link on the Configuration Summary page when you use the Test Agent or Test Controller configuration tools. If you are running Windows Firewall, the test controller setup adds the following exceptions to your firewall. Make sure that this exception has been added. QTController.exe Enable communication with the test controller.